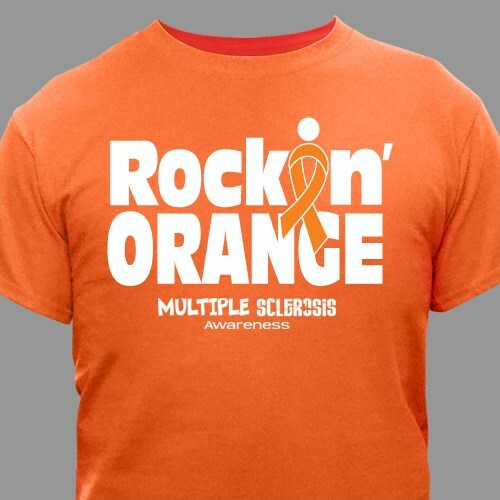 Support your loved one with this great Multiples Sclerosis "Rockin' Orange" T-Shirt, whether it’s your Mother, Father, Sister, Brother, Friend or any loved one you know battling with MS. With any Multiple Sclerosis Walk Event, our multiple sclerosis shirts can help you show your support and help raise awareness together. Our MS Awareness Shirt is available on our premium 100% cotton orange T-Shirts, machine washable in youth sizes XS-L and adult sizes S-3XL. Wear this MS Awareness T-Shirt at your next awareness event! Love the shirts. Fit is perfect both for me and my husband. Shipping was fast. Great experience all around. I'm happy with my purchase so far. I just received it today. Not happy that border around the screen print won't go away...I have washed it multiple times...it won't fade away. As a MS patient, a University of Tennessee fan, and a team captain in an upcoming Walk, it is PERFECT! The quality is great! Love it! It does run a little small though. I was afraid it would be too big and it is not. I would order a size larger than usual. The lettering sclerosis was not correct on shirt the first one. Then I called and was sent a replacement which looked the same. The decal must be like that which I'm not to happy with. Great shirt! Wearing it for a team fundraiser next weekend! Additional Info Multiple Sclerosis affects approximately 400,000 people in the US and an estimated 2.5 million worldwide. By showing awareness, you will help support MS and also help fund research for a cure. Take a look at our entire collection of MS Awareness Walk Gear & Apparel to show your support today!